A lot of football tickets have been issued or collected by Mr Bob Lord on the Unley Oval Gates. He’s been doing the job for 39 years, and, he says, there could be more years to come. There has always has been a Lord connected with Unley Oval. Bob’s father, Mr E A (Rich) Lord was the “grand old man” of Sturt. He was a foundation member in 1901, and had 52 years’ service with the Club. After 19 years as a trainer he put in another 22 years as a head trainer. His last 11 years were as a room steward. Bob Lord began on the gate as a favour to his brother, Stan, who for 25 years was Sturt Seconds Secretary and a league committeeman. From B Grade games (as they were formerly known) Bob graduated to league. And it became an all-year-round job with Colts and Thirds matches – and district cricket in the summer months. 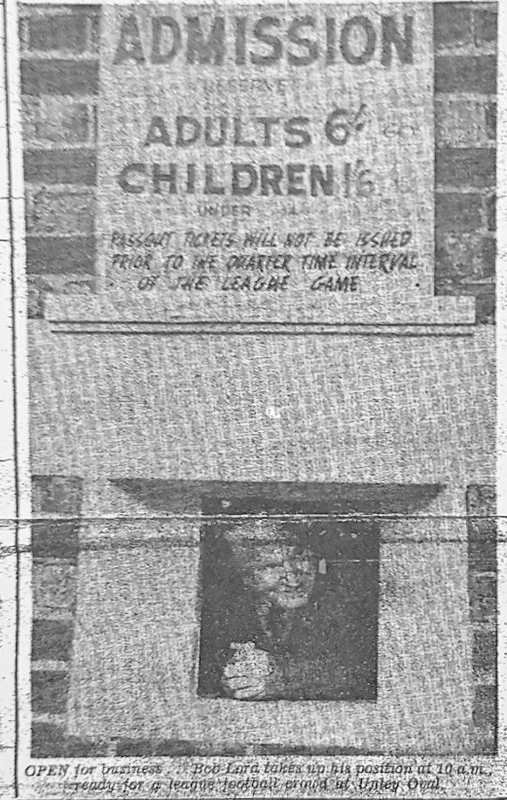 Bob has handled all kinds of sporting fans at the ticket box or gates – ranging from the “slightly merry” to “dear old ladies” who hold up queues. He needs a lot of patience while baskets are placed down on the ground, purses opened, money taken out, change counted, then back in the purse and basket picked up before the next “customer” can be attended to. Opening day, this season was the most difficult. Decimal currency brought long queues. Bob reached $1,000 “take” from his window for the South game at Unley six weeks ago. His biggest current problem is coping with the obvious 16-year-olds who ask for a “child’s ticket”. It’s because, Bob says the grandstand admission is now 60c. It was 39 years before he changed his first old £10 note at his window – a couple of weeks ago. Over the years Bob has never seen a match right through. But when all the stragglers are through the gates he is able to have a look. And he has seen enough to rank his best players. “Taffy” Waye, 1903 Magarey Medal Winner as the outstanding Sturt old timer. Len Fitzgerald as the best in the modern era. Paul Bagshaw as the best player now in SA football. But his best ever is not a Sturt player. The votes, goes to Wally Allen, South wingman. “He could do everything. Wally could run 30 yards bouncing the ball flat out, never missing a stride. Will Bob Lord reach 50 years of service? “I like to think so” he replies. Looking at the amount of work he does in his vegetable and flower garden at his home in Fairford Street, Unley, I rather think he will.